James Lehman, creator of The Total Transformation Program, examines the effects of acting out behavior on parents and the family, and reveals how to calm the storm in the home. Q: A child’s behavior problems can cause disturbances in a family beyond the relationship between the parent and the child, can’t they? I’ve had friends whose marriage suffered when their child started acting out. Is that common? One of the unseen costs of an acting out kid is all the different ways that the child’s behavior affects the family. Unfortunately, the effects on the family aren’t viewed by society, the courts or the school system as really relevant. So there’s not a lot of support built in for the family. They’ll determine that the family is “sick,” and then the family has to go to therapy. But I’ve met many families who were feeling the effects of behavior problems, and the family wasn’t sick. The problem was all the repercussions from the kid’s behavior. Picture what happens when you drop a stone into a pond and you see the ripples. Now picture that stone being dropped in again and again so that the ripples keep expanding and expanding. A child with behavior problems is like the stone in the pond. Every time he acts out, it’s like another stone being dropped into that pond. The ripples get bigger and more frequent in the family. He can’t solve problems any other way than acting them out. His main skills are defiance, manipulation and dishonesty, because he doesn’t know any other way to solve his problems or to deal with the realities in his life, which are, admittedly, often very painful. But no matter how painful his problems are, a child still has to take responsibility and learn to solve them. 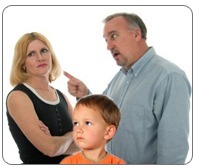 Marital conflicts emanate from child behavior problems almost always. One parent blames the other. What happens is that parents tend to look at each other through the “window” of the child. Instead of looking directly at each other, they look at each other through the kid’s behavior. When you’re in pain and uncomfortable and you look at somebody else through that kind of pain and discomfort, it distorts how they look to you. And it distorts how you feel about them. So you often find one parent blaming another or thinking the other parent isn’t doing it the right way or not doing enough. When this acting out occurs, it can start to push parents toward the edge of their relationship, testing how strong it is and how solid they are. Ideally you would like to think that it bonds parents together, but it doesn’t happen that way. The behavior tends to split the parents. Q: And the more split the parents become, the more problems develop in the family around that division. When this is going on, it’s easy to become overwhelmed by all the chaos in the family. How do you get through that chaos and get to the root of the problem? What parents need is a process by which they can be unified. I recommend that parents agree on certain principles and look at the actions that come from those principles. If our principle is, Johnny has to take responsibility for his behavior, then let’s all act that way and not worry about all the other issues that ripple out from that. Johnny has to take responsibility for his behavior, so let’s focus on that one thing. Let’s teach him problem solving skills. If there is a crisis, let’s handle it responsibly and productively. Responsibly means nobody gets hurt. And productively means that everybody can learn a lesson from it. Once the family starts to deal with the child’s problem, the problems secondary to his behavior start to settle down. Whether the secondary problems are the parent’s communication, the other children’s safety and behavior or the financial strain that occurs when you have a kid who’s acting out, those things tend to subside, once you focus on the behavior problem. So parents need to be able to communicate and not look at their relationship through the child. Rather, begin to look at your child through your relationship. See yourselves as a team. Parents find that the behavior calms down when they start working more like a team. First, because they find the common solution. They find something that works and that’s helping their child. Second, the family stressors go down. They’re able to deal with the normal stress of taking kids to soccer, taking kids to guitar practice or whatever they normally do. And they’re not dealing with the stressors of crisis, calls from the school, going down to the police station, or trips to the hospital or the emergency room. When I work with parents and talk to them about being a team, I find they get really in touch with that. They’re eager to find a way to enjoy each other’s company again. Because they realize their kid is like a loaded gun in their midst, firing whenever he wants. And they know that nobody can live peacefully with that. No marriage can work really strongly when that’s going on, because people are fatigued, angry, frustrated and afraid. The outcome of changing the child’s behavior is that parents communicate better. They feel better about their marriage and they feel better about themselves. I’ve seen it happen hundreds of times, and it can happen for you. Through product recommendations, Someone Else's Kids acts as an affiliate marketing partner for Zazzle and Amazon. If you and your spouse take opposing roles in dealing with your kids, you’re not alone. Many parents take on the roles of “good cop” and “bad cop” in the family. For instance, Dad is the kid’s best buddy, and mom is the nag. Or dad is strict and mom is a sympathizer. Which “cop” is right? And should you be a cop at all? I see two problems with the notion of good cop/bad cop parenting. First, is the very idea that somebody has to be a “cop” all the time. Parents don’t need to be cops. They simply need to be coaches and teachers for their children. Second, what’s really happening when parents become good cops and bad cops is that the kids have learned to split their parents. The area of the split is where kids go to get out of meeting their responsibilities. For example, Tommy goes to mom and says, “Dad’s making me clean my room before we go to the mall.” Or he says to mom, “Why do I have to clean my room? Dad doesn’t make me do it.” When your child makes complaints like this, both parents have to be supportive of each other. You have to be able to say, “These are the rules Dad and I both have, and you have to do it or you’re going to be held responsible for the consequences.” Then turn around and walk away. That’s it. Give simple statements of support. The more unified you are as parents, the more likely your child is to complete his responsibilities, because he doesn’t have another way out. The only way out is to act responsibly and do what’s asked of him. But what if you don’t really agree with what Dad is asking Tommy to do? If you have a problem with a rule or limit your spouse sets or a request that’s being made of your kid, don’t make a face. Don’t sigh. And, by all means, don’t argue with your spouse about the issue in front of the child…or even indicate that you are going to argue. Just tell your child he has to do what’s been asked of him. Then talk with your spouse later, after the kids have gone to bed and out of earshot. This is important, because kids pick up on non-verbal cues from their parents a lot more than you think. If your child sees that you disagree with what’s being asked of him, he’ll bring up the issue again and again, to split you and your spouse and to avoid meeting the responsibility. Simple statements of support work when you use them consistently. When Tommy complains that Dad won’t let him play Runescape before he does his homework, and you say, “Your father said you can’t play Runescape until you do your homework. That’s the rule,” you can bet Tommy will stop trying to split you and your spouse. James: When a child is between 18 months and two years old, they’ll start to walk away and say “no” to their parent. The child is practicing a new skill. Parents call it a phase because eventually, the “no” goes away and the child starts to operate within the guidelines of the family. When parents see things they can’t explain, they call it a phase. Parents are very prepared to tolerate phases. But they’re not prepared to tolerate inappropriate behavior. So they label it a “phase” because that makes it easier for them to accept it. Parents tolerate phases in adolescents in order to accommodate their kids. The sort of phase we’re talking about starts at around age twelve. There’s more testing of authority and testing of limits. You hear, “I just wanna talk to my friends.” “I just wanna stay in my room.” Kids spend more time instant messaging and wanting a cell phone. Parents see this correctly as a phase. And at first, they accommodate this. Most parents who are secure about their parenting will understand this and accept it. We see enough of this in our culture—on TV and in magazines—for parents to understand that this is something adolescents and pre-adolescents go through. What tends to happen, though, is that some kids start to violate family norms, and parents tend to deny that this is separate from the phase. Saying “This isn’t fair,” and stomping off to your room a couple of times is a phase. Calling your mother filthy names is not. Saying “I only wanna talk to my friends about this. They’re they only ones who understand,” is a phase. Getting high on drugs or alcohol is not. Q: If the behavior is inappropriate, does it matter whether or not it’s a phase? James: No, it doesn’t. I think the most important thing parents need to know about phases is it’s important to the child as well as the parent to maintain appropriate standards and boundaries through the phase. So, we set up situations where the child can act out the need for independence or act out the challenge of authority without being destructive, abusive to others or self-abusive. So parents can say, “If you don’t like what’s going on, feel free to go to your room. Feel free to say what you don’t like.” Parents should even accommodate this by giving kids time to say it. I think one of the most effective techniques is to tell your kids that at 7 pm, we’ll sit down and talk about the things you think aren’t fair. And then we’ll go from there. Because then when the kid starts to escalate, you can say, “Save it for seven o’clock.” That way, you have a problem-solving time set aside. But if the kid starts to call his mother and father all these disrespectful names or call his sister or brother foul, sexual names, I think that’s not a phase. That’s abusive behavior. And it needs to be stopped. The task of adolescence is individuation. And sometimes adolescents are so uncomfortable with this task that they’ll use hostility and abuse to accomplish that. Parents have to maintain the standards during those times. There’s no excuse for abuse. That’s not a phase. Deal with it as a violation of family rules. Not as a moral issue, not as something to panic about. It’s a violation of family rules, and this is how we have to deal with it. Parents should have clear sets of consequences for this so they can manage it. Q: How do you know when to address a certain behavior, instead of hoping the child grows out of it? James: If it’s hurting the person who’s doing it or hurting other family members, people in society, teachers and other students in school, it needs to be addressed. Adolescence is a phase where you start out as a dependent child. It’s called the “latency age, “and you end up as an adult, usually in college. Adolescence doesn’t end with adolescence. That phase of development lasts into the early twenties, and there are different earmarks for the different parts of that phase. For instance: “I can only talk about this with my friends.” “I wanna look hot.” “I’ve gotta look cool.” And then you’ll see a slow shift to the next phase where they want to date and be popular. Then you’ll see a slow shift to the next phase where they individuate themselves from other teenagers. So, at age twelve, it’s me and all teens. At age seventeen, it’s me and my group. During this period, it’s important for parents to understand that if kids gravitate toward a negative subculture, there’s a problem there. In other words, if kids start hanging out with kids who get high all the time, they’re getting high, and they’ll lie to you about it. But worse than that, they’re seeking a subculture that doesn’t expect anything else out of them, except that they get high. If you hang out with people who play soccer, they expect you to practice. They expect you to stay healthy. They expect you to show up for games. They expect you to be a team player. There’s a cluster of expectations that kids in other groups have. If you’re part of the chess team, there’s an expectation cluster. If you’re part of the honor society, there’s an expectation cluster. If you’re part of a church group, there’s an expectation cluster. When kids gravitate toward groups that don’t have any other expectations for them, except that they’re juvenile delinquents or they shoplift or they get high, parents should take alarm at that. Q: So, if you’ve got a situation that is violating family norms, what’s the best way to address it with your child? The kid may turn away. The kid may say, “None of your business.” The kid may run a lot of excuses. But the parent has to calmly keep the focus on what they’re seeing and what they want to change. And how they can be helpful. Again, the kid may not change, but the parent has planted the seed and met their obligation. And they can have those conversations once or twice a week.